There’s nobody more primed for a big-screen biopic than the late hip-hop phenomenon Tupac Shakur. Before he even reached his mid-twenties, he had experienced several chart-topping hits, had a few of his albums go platinum, acted in a few movies, and become something of an immediate icon in the industry for his real representation of the ghettos from which he was raised, up until his now infamous tragic murder in 1996 which to this day remains unsolved. With all that information, it’s somewhat baffling that there hasn’t been a big-screen biopic already made of him, but now here comes All Eyez On Me – named after one of the rapper’s most popular records – to try and change that. However, while it cannot be faulted for its obvious good intentions, the film is an ungodly structural nightmare that fails to even capture the smallest glimpses of humanity in an otherwise iconic figure. The film covers the whole life of Tupac Shakur (played by eerie lookalike Demetrius Shipp Jr.), and that’s no exaggeration – the movie begins before he is even born, as his mother Afeni (Danai Gurira) celebrates freedom from her imprisonment for her association with the Black Panthers movement. Young Tupac grows up rough on the streets of New York, then Baltimore, and then California, before catching the attention of several figures in the industry for his flawless lyricism and harsh representation of the streets he grew up on. From there, it’s the story of how he quickly rose to high-profile status as one of the greatest rappers of the late 20th century, including his imprisonment for false sexual assault charges, and his heavy involvement with the unhinged Suge Knight (Dominic L. Santana) and his record label Death Row Records. This is as straightforward a biopic as you can get, one that consists of almost nothing but exposition dialogue that tells you the story of Tupac Shakur instead of showing it to you in an interesting or captivating way. You could almost re-title this film Tupac’s Wikipedia Page: The Movie and it would be extremely fitting; it’s all information that’s already public knowledge re-enacted for the screen, that adds little to no humanity or even anything new to it, and leaves you feeling like you know just as little about the man himself than you did going in. In fact, you could probably go look up Tupac’s actual Wikipedia page and find more depth and personality to it, because like the weakest of biopics it shows us several moments in his life all in one go instead of picking one to develop and use to expand the character that it’s trying to represent. That leads into the film’s biggest problem: it has absolutely no focus, which for a biopic can be pretty lethal. Instead of choosing one major event in this person’s life to show on-screen, this movie decides to choose ALL of them, leading to scenes that feel rushed and underdeveloped primarily so it can all fit into the film’s running time (which, given that this is an over two-hour movie, is already baffling that there’s this many scenes that just come and go specifically to save on time). Things will just happen in this movie without much thought or depth to them, like Tupac’s big break from working with Digital Underground will just come and go despite it being a major stepping stone for his career, and scenes involving his mother’s initial drug addiction and subsequent rehabilitation – again, all within a matter of minutes – will conclude without a proper dramatic resolution. Characters will also just come and go, including a small role for Tupac’s friend Jada Pinkett (Kat Graham) which, given the real-life Pinkett-Smith’s reaction to this film I take with a pinch of salt, and Lauren Cohan who literally only shows up for not even a minute as Tupac’s early mentor, and whose biggest scene involves her telling Tupac she got him an audition, and then she disappears entirely for the rest of the movie. I haven’t even yet mentioned the pointless framing device of Tupac being interviewed while in prison, which like the rest of the movie only cares to speak in expository dialogue without much in the terms of characterisation or even personality. This whole project feels like it was made in the shadow of the success of Straight Outta Compton, and doesn’t care to actually explore the person that Tupac actually was but rather to tell his entire life story in this haphazard and rather soulless manner. I will say this about it, however; the acting is not half bad in this. Demetrius Shipp Jr. is not only a scarily exact carbon copy of the real Tupac – it’s almost as if he was cloned at the time of his death and Shipp Jr. is the resulting scientific experiment – but he is acting his little heart out in this, bringing to life what is sadly an otherwise lifeless portrayal of the man himself, and selling every scene he is in to be a genuine standout. It’s nice to know that the actor playing Tupac is the best thing about a film where Tupac is the main focus, and despite the film’s many flaws, he is honestly not one of them. But given the legacy that Tupac Shakur left upon his untimely demise, he and his fans deserve a far better movie that properly explores the man as well as what he did, and all that All Eyez On Me does is set the bar so unfortunately low for Tupac biopics that whatever comes after will surely be a structural and thematic improvement over this ill mess. 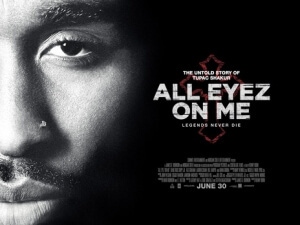 All Eyez On Me would be better off titled Tupac Shakur’s Wikipedia Page: The Movie as this haphazard biopic is nothing but exposition dialogue and a collection of unfocused scenes from the late rapper’s life that add no humanity or emotional understanding of the central figure, leaving his fans and former collaborators in the lurch and deserving of a far better movie that truly explores the man himself.